It’s always exciting when the UPS truck stops at your house, isn’t it? Recently he stopped at my house and dropped off a package from Pass it Down. They sent us a preview of their new greetingStory line of cards. We had seen samples of these at RootsTech earlier this year, and now we have the opportunity to use and review them. Chris Cummings founded Pass it Down after watching his mother suffer through and eventually pass away due to early onset Alzheimer’s as a result of MS. Seeing his mother’s memory fade, he wanted to prevent others from losing their family stories, too. Pass it Down is an online storytelling, keeping and sharing community. People can sign up for a free account and, using Pass it Down prompts or their own topics, record stories. These can be shared (or not) and preserved online. It’s a great way to keep and share memories among family and friends. While the online platform that Chris and his team have built is top-notch, they realized – like many in the storytelling space – that a strange paradox exists. Technology makes telling, recording and sharing stories easier than ever, but it also magnifies the generational gap. The younger generation – digital natives – has no problem using technology to tell and share stories. The older generation – baby boomers and grandparents – grew up without computers and tend to prefer writing things down to preserve stories. The generation in between those two – the middle-aged people – can go either way. Some prefer paper, others a screen. Because of the differences in preference, it’s difficult to get those precious and essential stories from the older generation to be enjoyed by the younger one. Even though both want to preserve those stories, there’s not an easy way to do so. Write the story on the card and give it back to the sender. Scan the QR code on the back to go to passitdown.com and answer the question. Go to the unique URL on the back and answer the question. Options 2 and 3 go to Pass it Down’s site where they can add their stories. A great feature of the Pass it Down platform is that you can use text, video or audio to share a story. The box we received had 6 different cards in it, along with kraft paper envelopes, an instruction card, and stickers. The cards are 5 inches square (12.7 cm) and are the same quality you’d get with a Hallmark greeting card. The front of the card asks the question, and inside there are instructions and writing space. The back of the card contains some additional instructions. Of course, it’s pretty easy to understand how to use these. You answer the question by either writing on the card or you can go online and record the memory. If there isn’t enough space, you can write on another sheet of paper and include it in the envelope. This is the great part about this concept. People who prefer to write can write, people who want to use a computer can do so, too. Pass it Down offers several options for greetingStory. You can purchase 12 or 24 cards at once and have them sent to you. This is a great option if you want to ask different people questions. You can also purchase a monthly membership where cards are sent regularly to a specific individual. They can receive 1, 2 or 4 cards per month. This is ideal if the interviewee lives too far away to see regularly. Either way, you get cards with simple yet thought-provoking questions to be answered. I wanted to show these to some baby-boomers, so I sent these to an aunt of mine. She only lives a couple of miles from me, so I see her often. However, most of her children live in different states, so I delivered them and instructed her to imagine one of her kids had sent them. She loved the idea of receiving a card in the mail. In the digital world we now live in, that seems old-fashioned, but for her, it was a simple reminder of life as she grew up, raised her family and grew older. Since most mail today is either bills or junk, a card asking to share an experience is something different and special. She also liked the option to write on the card and mail it off, or to use her computer and do it online. She admitted she wasn’t much of a writer or a computer user, so she wasn’t sure that she would use these (or anything else) very consistently. However, when I told her that she could upload audio or video, she said she would do the audio, and could possibly be “cajoled” (her word) into doing a video. I’ll add that I think it would be best if you can do all of these. Take the handwritten card and scan it, then upload that image to Pass it Down. Record a video (or audio) on your phone and upload that, too. It’s easy to overlook right now, but you’ll appreciate having a handwriting sample as well as the voice and non-verbal mannerisms of someone after they have passed. Adding other media online will also paint a richer narrative. Having pictures, video and even audio of someone will help preserve their legacy after they have gone. Is greetingStory a good idea, or a relic of the past? If you’re like me, my wife, or most of my family and friends, you really like the convenience of having all the information you need right in the palm of your hand. Having information NOT on our cell phone could be considered annoying. But what I found was that having something physical – something as simple as a greeting card – in my hand wasn’t annoying, but actually a little disruptive. It took me out of my normal thought process. When this happened, I was suddenly more inclined (Or interested. Maybe motivated. I’m not sure the correct word, but it’s one of those.) to get the question answered. I had a paper that needed to be dealt with, so it also added to the urgency. That is always a bonus when we’re talking about irreplaceable memories. As we’ve talked with customers, friends and other businesses, we’ve found that the biggest challenge in family storytelling is time. Finding the time to dedicate to gathering the stories, the pictures, and documents that create a life narrative takes an extraordinary amount of time and energy. It requires intentional prioritization. Like I said, having a card to write on is just different enough to be disruptive. I don’t think it’s as disruptive as the automobile was to the wagon industry, or the iPhone was to the cell phone and computer industry, but it does make you stop for a second. For many, that momentary pause can help you move beyond wanting to record a family story and actually recording it. By only having one question at a time to answer, a person won’t be overwhelmed with the feeling of needing to record everything about their life. These cards do a great job of bridging that generation gap I mentioned. The option to write on the card or go to the website and record your memories is a wonderful approach. So where can I get these? 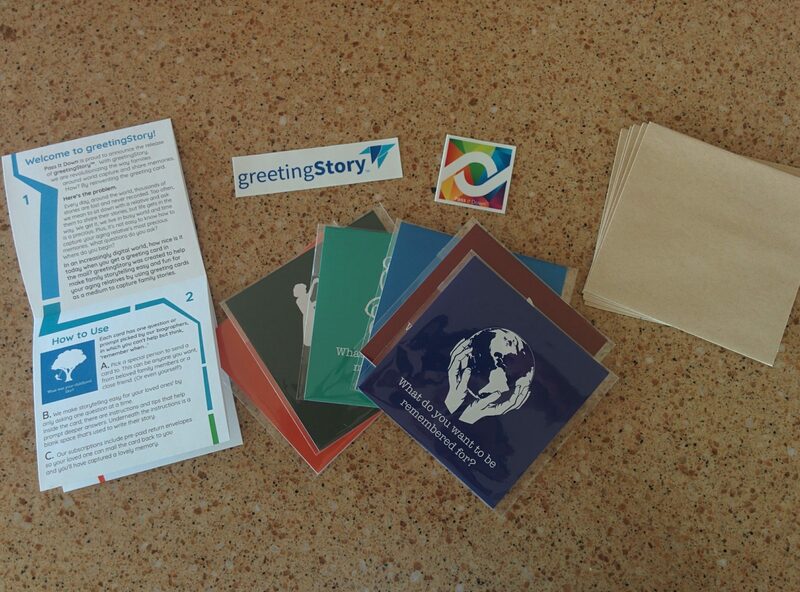 greetingStory will be available soon with different pricing options. Subscriptions can be purchased for $6 a month (that gets 1 card per month), $10 a month (2 cards) or $16 a month (4 cards) per month. Pass it Down also offers the option of purchasing packs of cards – called Memory Boxes – for $29 (12 cards) $59 (24 cards) or $99 (48 cards). Should you choose to purchase a Memory Box, use the coupon code “Legacytale25” to save 25%. 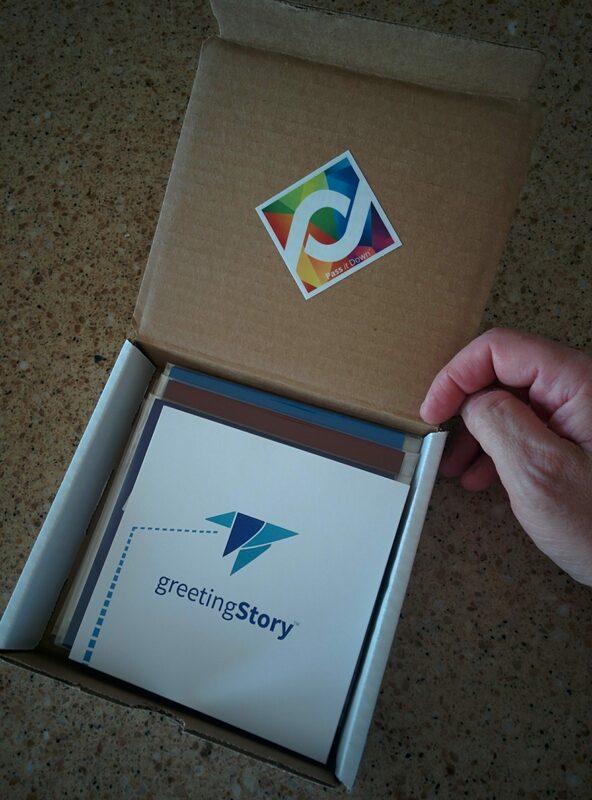 greetingStory is a great idea to bring together generations and preserve family stories. The quality of both the cards and the online platform is outstanding, and using both effectively joins the analog and digital worlds. If you’re looking for a unique way to preserve family stories and avoid being overwhelmed by the volume of life stories, greetingStory is worth considering.